When we talk about today’s war for talent, it’s no surprise that candidates are in the driver’s seat. They expect to be treated like consumers. They expect their experiences to be built on a foundation of amazingness, driven by elements of personalization—talent nirvana if you will. This magic happens when you meet the right talent, in their element, on their time. To achieve this, you must embrace modern advertising. 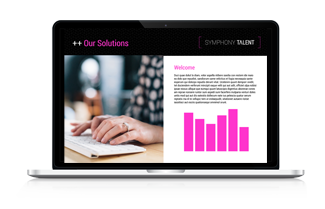 We aren’t talking complicated algorithms and weird science here, we are talking about a sophisticated, streamlined formula that in short takes the guesswork out of recruitment advertising. On April 27, 2017, Bill Boorman, Founder of #tru Conferences and Loren Nelson, VP of Solutions Engineering at Symphony Talent gave the webinar, From Agent to Superhero: Why Programmatic Media Is All the Rage.